The summer is here, the only respite from the Formosan warmth may be the Birdfair at Rutland - will you be there? Birds added to the last post-January 2013 list: Blue-breasted Quail flushed in front of the car in Huben in May - a quicker responding Fairy Pitta would have been prefered. Dipped last year (really all year?) - I had decent views last week near Manjhou, Kenting, of a Black-chinned Fruit-Dove. And finally, confident views of White-throated Needletail. My neck hurts. The 2014 Dasyueshan Intl’ Bird Race is scheduled for the last week of April. Foreign teams warmly welcomed. No, no it’s not about rampaging feral dogs of shambolic romanization. 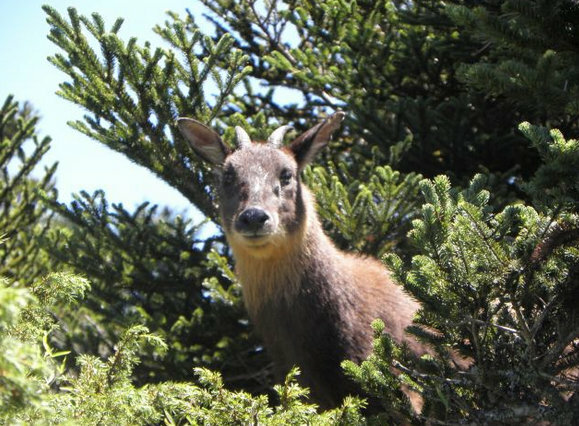 It’s the fact that the common Chinese name for the Taiwan Serow (Capricornis swinhoei or Naemorhedus swinhoei) is 山羊 (literally ‘mountain goat’). I feel its value is diminished when most people just think of it as a feral, mountain-living, domestic goat. The cause of conservation is not served with a crappy name. Taiwan’s only endemic bovid, is somewhat similar in appearance to a goat with a short body and long legs, dark tan with yellow spots on the jaw, throat and nape. The typical serow weighs around 30 kg, height of around 70 cm. Conical horns, 10-20 long, are not shed. A herbivore, and typically considered a browser (look out for it on the grassy lawn at Dasyueshan, and replanted landslides). Primarily diurnal but also has nocturnal feeding periods. Look out for it on steep cliffs, salt licks, and river crossings (Taroko gorge). So does someone have a better Chinese name for the Taiwan Serow? Change must come!!! Not for Taiwan as such, but nevertheless very useful for many East Asian birds. The Birds of Korea android app is very good and worth the cost. Try the free version here. Thanks to the knowledgeable Chuck Hung for alerting me to this and below. Many thanks to Per Alström et al for a very good pdf guide to identifying the Phylloscopus & Seicercus warblers in China. Can be downloaded here. Rumors of a new field guide (painted illustrations) for Taiwan birds coming out in October. While the main text will probably be in Chinese, I expect much of it will still be very useful to foreign birders. Will update. Update December - latest prediction is spring 2014. My scheduled 2014 birding tours are here. Don’t forget I arrange custom tours for plants, insects, scenery, culture and mountain goats too.